How Long do Scooters Last? By TCMay 24, 2013Comments Off on How Long do Scooters Last? This question is one of the most commonly asked by visitors to our shop. And it is also one of the toughest to answer. We have seen recent model Vespas sold within the last several years with as many as 55,000+ miles on the odometer and still climbing! One local owner of the more diminutive Genuine Buddy 125, has over 41,000+ miles! These kind of examples have been strictly and lovingly maintained by their owners, and is a testament to how well these little machines perform and deliver if properly maintained and serviced. That said, we have also seen a few disasters with relatively low miles come through our service department, due to neglect and lack of proper scheduled servicing. Like so many things, a little preventive care and general maintenance, will go a long way in keeping your scooter running like a top for many years and many miles! What’s Up with Chinese Scooters? By TCMay 17, 2013Comments Off on What’s Up with Chinese Scooters? A Brand New Chines Made Scooter off Craig’s List for $999.00… How Bad Can It be? Many visitors to our shop ask us just how bad those cheap Chinese scooters can be…. given that they are allowed to be sold here in the states. The fast and honest answer by anybody that works in the Powersport Industry will tell you that they are unreliable, difficult (if not impossible) to service and potentially threatening to both life and limb of the rider. If a person were to really think things through about these vehicles, they would realize that the mass produced Chinese scooter industry is just like the mass produced Chinese microwave, DVD or toaster industry. China has built billion dollar empires on the premise that they sell things that function for a short period of time, and when they break, consumers throw them away. The same goes for their scooters. An additional problem for Chinese scooter owners is finding legitimate shops that will work on them. Because parts are difficult – if not impossible – to source, and quality is so poor, most shop owners will turn Chinese scooter owners away for service. 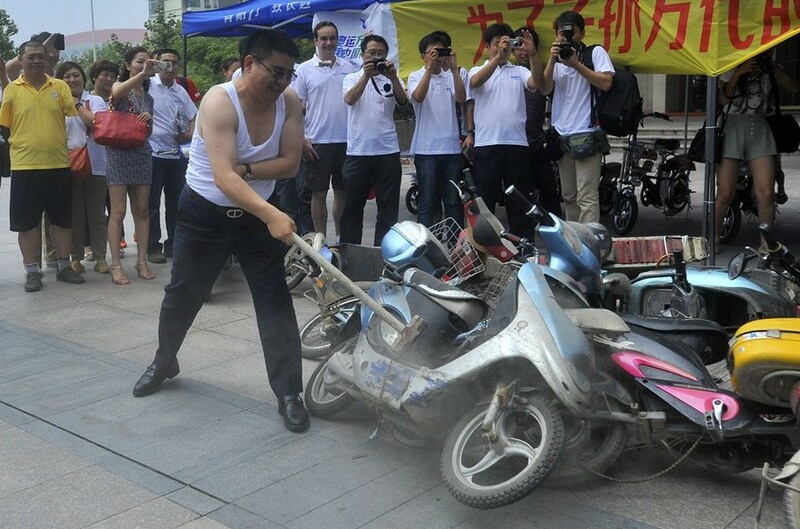 Some owners will try to repair their Chinese scooter themselves. But they quickly realize they cannot locate the exact parts they need. And, most of the parts you can get online for cheap Chinese scooters are going to be the same cheap quality as the ones that broke in the first place. So why replace bad parts with more bad parts? And while installing replacement parts, the build quality of Chinese bikes is so poor, it practically guarantees that you will break or damage more parts trying to get at the part you are trying to replace! There have been so many of these poorly manufactured vehicles pouring into our country by importers looking to make a fast buck, that even the Department of Transportation is considering banning many of the importers from bringing their vehicles unless they can pass certain build and quality standards that are currently not in place. The old saying ‘Ya get what ya pay for’ could not be more valid in the discussion over Chinese made scooters, so Buyers Beware, you have been warned! Does Vespa Motorsport sell Mopeds? By TCMay 17, 2013Comments Off on Does Vespa Motorsport sell Mopeds? We are often asked if we sell mopeds, or visitors to our showroom will ask how much our Mopeds cost. The truth is, we DO NOT sell mopeds. We do sell scooters, which are markedly different from mopeds. So how do they differ, you might ask? The big difference between a moped and a scooter is the size of the engine and the amount of power it can output. Generally, a moped has a relatively smaller motor and is classed as a vehicle with a displacement of below 50cc. In most cases, the fastest a moped can go is around 30 to 35 miles per hour. Therefore, mopeds are designed to be ridden on streets and roads rather than freeways. When looking at the body of a moped, it looks somewhat like bicycle. In fact, mopeds are built as a bicycle but with a motor built-in. Most cities, but not necessarily all, have legislated that mopeds must have pedals to be legally defined as a moped. In addition to being safer, it also allows for a younger riding age in a lot of locations. Also, mopeds can usually fit only one passenger. Scooters, in comparison, have a bigger motor and are mostly between 50cc and 300cc. The motor of a scooter is normally located in the back of the scooter and underneath the driver’s seat. Scooters are usually a lot quicker than mopeds, which can allow them to ride on highways and carry an extra rider/passenger. In short, we do not sell mopeds. See below for the difference. Can I ride one of these on the freeway? By AlexMay 16, 2013Comments Off on Can I ride one of these on the freeway? In California, any scooter with 150cc of displacement or more is legally classified as a “motorcycle” and all motorcycles are freeway legal (see California vehicle code section 400). Any scooter with less than 150cc of displacement is not freeway legal, therefore, even though you still need a motorcycle license to ride a scooter in this class. At Vespa Motorsport, we have a variety of scooters that have 150cc or more of displacement, many freeway legal scooters in other words. However, just because a 150cc scooter is freeway legal does not mean it would be wise to ride one on the freeway, so while the law is one thing smart practice is another. 150s must be driven constantly at full-throttle (high rpm) to compete with freeway traffic. They are air-cooled, not water cooled, which greatly increases motor wear at high rpm. They are lighter than a scooter that is better designed for the freeway. 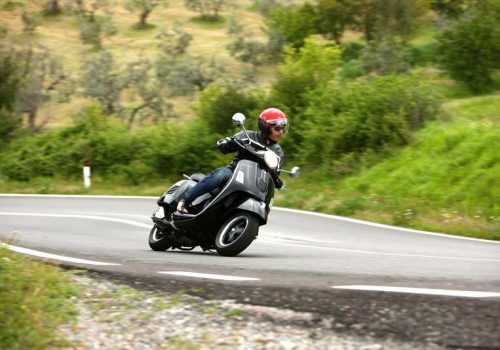 For these reasons, we recommend a scooter in the 300cc class or more for serious freeway riding, including the following models: GTS 300 Super, GTS 300, GTV 300, GTS 300 Super Special Edition, Piaggio BV350, MP3. (links to freeway class bikes). You’ll have less to worry about and you’ll be comfortable if you do decide to take your bike on the freeway. Your scooter will thank you too. By TCMay 10, 2013Comments Off on Why Buy a Scooter? 1) They get amazing gas mileage. 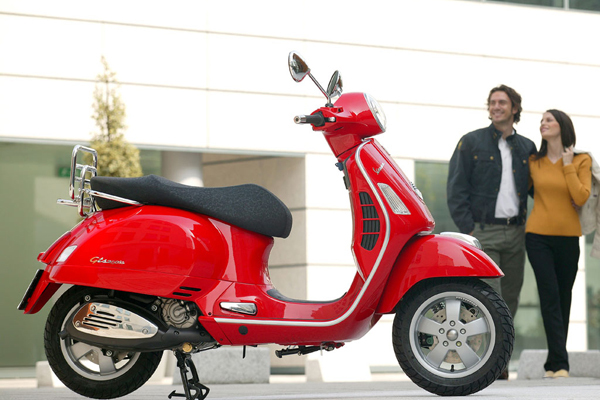 A champion performer like the Vespa LX150, for example, will get around 65 MPG. The Buddy 125 gets 90 MPG! Even freeway class scooters, such as the Vespa GTS300, get 60 MPG! 2) They are Sooo easy to drive. All the new scooters we carry are automatic with step through frames. Our Scooters are engineered to be comfortable and easy to drive, this is the whole premise behind the “scooter” design. Bringing transportation to the people. 3) They’re inexpensive. Compared to a car, the Vespa Primavera with it’s low MSRP is a fraction of what a new Honda or Toyota would cost. Combined with the gas mileage (as well as maintenance and insurance costs) owning a scooter is also a lot less expensive than owning a car. 4) Two-Up Riding. Most scooters are equipped to handle two riders. So bring your friend, your wife, your partner, your husband, your boyfriend, your girlfriend… or even your favorite four legged pet! Riding together is twice the fun! 5) They’re free to park (or nearly free). More cities are accommodating the increase in motorcycles and scooters on the road. 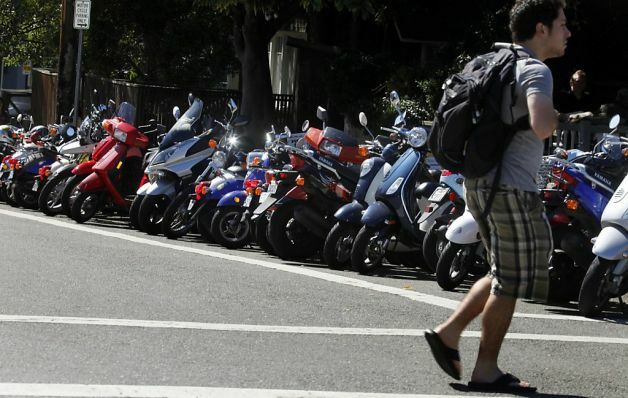 In San Francisco, new motorcycle-only parking meters are sprouting up in downtown areas and they only cost around $3/day, compared to $30/day for a car. Many parking lots offer free parking for bikes and we have even heard that meter maids will sometimes turn a blind eye to illegally parked scooters! As a result, you can usually park very close to your destination. Scooters also fit nicely between cars—just leave enough room to get out. 6) They’re cheap to insure and maintain. Most personal scooter insurance rates are under $200.00 a year for full coverage. Rates will obviously vary depending on your personal circumstances, but it’s definitely cheaper to insure a scooter than a car or motorcycle. 7) Scooters look cool. 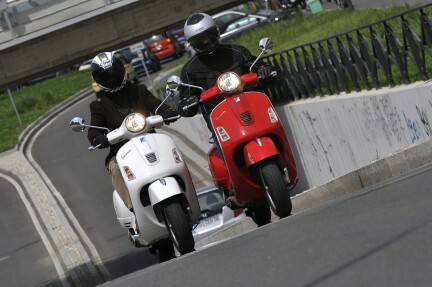 The Italian scooters—Vespa and Piaggio—lead the pack every year with their elegant design while models like the Buddy and Stella are not far behind. 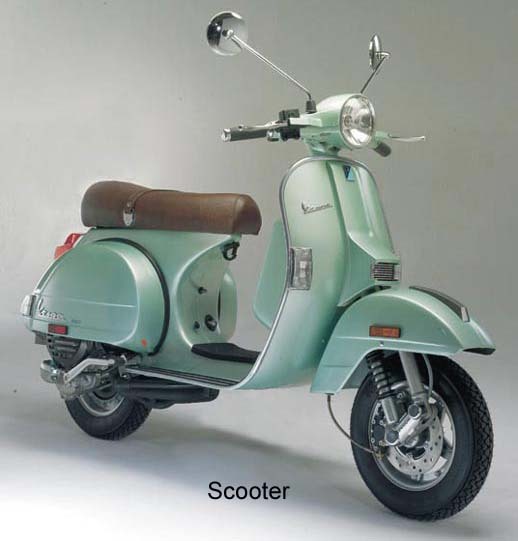 Fans of Quadrophenia will especially dig Vespa Sprint model with its Euro square headlight and chrome trim. If you’re searching for a more modern look, the Piaggio BV350 has a nice, aggressive stance with tons of power, comfort and cutting edge style. 8) They’re really fun! 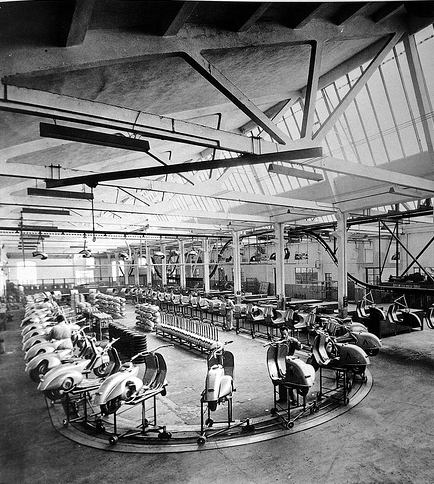 Perhaps the best reason to ride a scooter is due to the universal ‘Fun Factor’ these incredible machines provide. Young or old, guy or girl, all agree that riding a scooter is the most fun to be had in two wheeled personal transportation! Test-ride one today and you’ll agree: owning a scooter is a blast. 9) And a million more. there’s just not enough room on the internet to write all the reason to own a scooter. All scooters sold by Vespa Motorsport come with a warranty (unless otherwise noted). In the case of new scooters, they are provided with a manufacturer’s warranty, whereas with used scooters, Vespa Motorsport will offer a shop warranty for 30 days after purchase on most models. See below for more specific information related to the various scooter brands offered at Vespa Motorsport and the warranty coverages provided. Note: Manufacturer Warranties cover factory defectives and come with detailed terms and conditions , stop by or contact us for more info. New Vespa/Piaggio scooters NOW come with a 2-year manufacturer’s warranty (2014 and newer). There are no mileage restrictions, the 24 months begins on the day of purchase, and the scooter must be taken to an authorized Vespa dealer to claim warranty work. To keep your warranty valid, you must follow the servicing schedule as outlined in the warranty manual, including the 625-mile break-in service. Your warranty is transferable if you sell it. The servicing must be done at an authorized Vespa dealer – and there are specific exclusions from the warranty, including cosmetic aspects or defects related to body work among others. In addition, all Vespa/Piaggio scooters come with 2 years of roadside service for free. A two year Extended Warranty is also available within 90 days of purchase on your new Piaggio/Vespa scooter. The Piaggio/Vespa Extended Warranty is an extension of the manufacturer’s warranty and covers the same items and has the same exclusions. It also extends roadside service coverage for two years. In addition, the extended warranty is also transferable and can make a Vespa or Piaggio scooter extremely easy to resell because the full warranty coverage is expanded to FOUR total years with no mileage caps (2014 and newer, or 3 years on 2013 and older). All new Genuine scooters come with a 2-year manufacturer’s warranty. There are no mileage restrictions and the two years begins on the day of purchase. For warranty repairs, the Genuine scooter must be brought to an authorized dealer. As with other warranties, regularly scheduled service is required but not included as part of the warranty coverage. Genuine scooters are also offered with roadside service for two years. There is one other important aspect to the Genuine Scooters warranty coverage: it is not transferable. This means that if you bought a Genuine scooter one month ago and now would like to sell it (with 23 months left of warranty coverage), unfortunately, the buyer of your Genuine scooter will not have warranty coverage. Kymco offers a two-year warranty on all of their scooters. As with the Genuine and Piaggio warranties, the Kymco warranty also has no mileage restrictions. The Kymco warranty, however, covers the whole scooter against malfunction for the first year, while the second year includes coverage the Engine and Electrical components (excluding battery and light bulbs) . The Kymco warranty, unlike the Vespa/Piaggio and Genuine warranties, does not come with roadside service. The Kymco warranty, like the Vespa/Piaggio warranty, is also transferable. We at Vespa Motorsport have the utmost confidence in the used scooters that we offer and we want to make sure our customers share this confidence. With this in mind we offer a 30-day warranty on all used scooters that we sell, and this warranty covers the scooter against malfunction. This warranty is only offered by Vespa Motorsport and can only be serviced by our shop. If you have any other questions about warranty coverage or warranty repairs, feel free to talk to our service department. Link to email form. Do I need to carry scooter insurance in California? By TCMay 9, 2013Comments Off on Do I need to carry scooter insurance in California? Protection against motorists lacking insurance is recommended for motorcyclists. Why? Because nearly 1.5 in 10 motorists lacks insurance. Since automobile drivers are often the culprit in crashes with motorcycles, it is critical to safeguard oneself monetarily. In California, the mandatory type of scooter insurance coverage is minimum liability. Minimum liability covers you in financial terms if you are found to be at fault for personal injuries or damages to a 3rd party. California has regulations mandating the minimum degree of liability coverage you must have. Typically, you will see these liability coverages posted as three cash figures. In California, the minimum requirements are currently $15,000/$30,000/$5,000. With a Vespa, the all steel body and automotive quality paint finish results in costly repair bills so that just knocking over your bike in a driveway can, potentially, lead to the bike being written off by the insurer. Always remember that standard liability coverage fails to offer protection to the rider, the machine being ridden, or passengers – only your legal risk as required by the state of California. One saving grace with scooter insurance, is that it’s very affordable next to car and large motorcycle insurance. Since the scooters we carry are relatively low displacement engine size (under 500cc) your insurance should be pennies a day. We’ve heard of rates from $200 to $500 per-year. Where can I park my scooter and do I have to pay the meter? By TCMay 9, 2013Comments Off on Where can I park my scooter and do I have to pay the meter? California Vehicle Code section 22503 states that a motorcycle must be parked with one wheel touching the right-hand curb, or, on a one-way street, one wheel must be touching either curb. Can I park a motorcycle on the sidewalk? The short answer is no. Under the California Vehicle Code section 22500, no motor vehicle may be parked on the sidewalk, including scooters. However, some jurisdictions do not enforce this rule. (San Diego, for example, seems to be very lax about this. But some cities can be militant about enforcement, so, in other words, park on the sidewalk at your own risk! Is it legal to park between metered parking spots in California? Again, the short answer is no. However, jurisdictions vary significantly in their enforcement of this rule. In some California towns, it is unheard of to receive a violation for parking between metered spaces. In many others, however, cops and parking enforcement officers will quickly cite you for doing this. In San Diego, it is a fairly common practice among scooter and motorcycle riders, and the writing of citations seems pretty rare. However, do so at your own risk! Is it legal to share metered parking spots in California? While it is rare to hear of motorcyclists getting ticketed for sharing metered spaces with other motorcycles (or car), it can happen. This seems absurd (although the words “absurd” and “law enforcement” go together far more frequently than they should). If you aren’t familiar with parking enforcement in a particular area, we recommend asking other riders – or better yet, a meter maid, whether their policy is to ticket motorcycles for sharing a metered space. Beware, though, that if one officer tells you it’s okay, and another cop gives you a ticket, you probably won’t have much luck fighting the ticket in court. Keep in mind if you share a metered spot with another vehicle that is already parked, make sure there is enough time on the meter (cough up some change). If the meter expires, both vehicles will get ticketed for sure. Can I test ride a scooter BEFORE I buy it? By TCMay 9, 2013Comments Off on Can I test ride a scooter BEFORE I buy it? We absolutely do offer test drives. We even encourage them so you know what you’re getting into! You must bring a valid M1 Motrocycle Drivers License or valid Learners Permit if you want to drive. When you agree to the terms of a test ride, you are legally and financially for the care and handling of the scooter, so be prepared to take responsibility for the bike you’d like to ride. If you aren’t sure if the scooter is too big or powerful to accommodate your riding style or experience, ask one of our staff members to fit you for a scooter and they’ll be happy to offer recommendations. Bring your helmet if you have one, or we will supply you with one of our loaner helmets. Same with gloves bring a good pair, preferably leather and/or padded, like the NAPA or Motopecan gloves available in our shop. We do NOT have some loaner gloves on hand. Any jacket or hoodie with long sleeves will do. We strongly recommend armoured jackets such as the ones we sell in our showroom. For your legs, jeans are best for safety. On your feet, a sturdy boot or shoe is safest. Tennis shoes are ok on scooters since your feet rest is on a platform and there are no gears to change. Most of the confusion on this issue comes out of how the word “scooter” is used. We always use this word to refer to Vespa and Genuine scooters etc., but the California Vehicle Code, for instance, defines “scooter” as something completely different from the Vespas and other scooters that we sell at Vespa Motorsport. Legally then, the scooters at Vespa Motorsport are either designated “motorcycles” (if they have 150cc or more) or “motor-driven cycles” (if they have fewer than 150cc). At the DMV page linked above, for instance, they show an image of a 49cc Yamaha and define it as a “motor-driven cycle” that requires an M1 motorcycle license. Thus, a motorcycle license is required for all of the “scooters” we sell, and scooters with 150cc or more are freeway legal. One caveat: if a scooter or motorcycle has 3 wheels, such as the Piaggio MP3, it does not require a motorcycle license in California. A class C, car license, will suffice for these. That being said, we still highly recommend a Motorcycle license to operate one of these vehicles. How do I get an M1 license in California? Step 1: Take the DMV’s 25-question permit test. You can take a sample test, schedule an appointment, or find the motorcycle handbook all available on the DMV website Click here. Step 2: Take a motorcycle safety course (OR take the DMV’s driving test after you complete step 1). That’s it! The good news is that getting a license in California is a pretty easy, 2-step process. The further good news is that once you get an M1 permit or an M1 license, you can visit Vespa Motorsport and test-drive some of our scooters!